Please don't leave. Not yet. Sigh. No one wants to ask for money. Except Mit Romney. And ohhhhkay. Barack Obama. And also those silly do-good-tree-planters Friends of Trees. They're all increasing the city's tree canopy by leaps and bounds and unable to do it for free. But you know what? Even THEY had to once overcome the instinctive recoil at the thought of a hand-extended, sincere-smile, clipboard-out request for money. For YOUR money. For my money. Money for some kind of purpose. Here's the opening sentence, I suppose. The one where I attempt to make my strongest case for YOU to donate YOUR money to yet another cause. Since I really don't want you to leave and slam the door, I'm going to let you pick your favorite opening sentence among these 3 pieces of art that i brutally slapped my words upon. If none of these work, please write one in the comments beneath this blog post and I'll edit it back in and give you proper credit for a plea well-written. 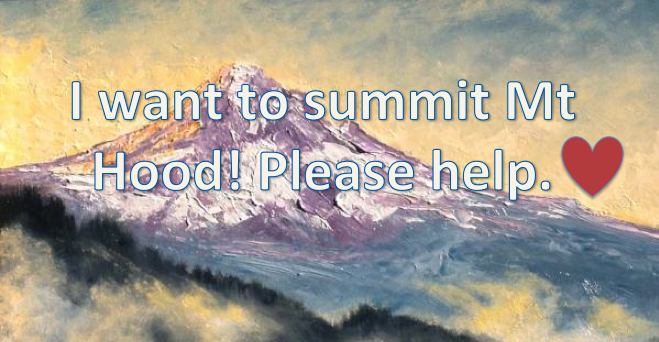 Stunning Mt Hood art created by Jim Gola, an artist you may have never heard of until right here and now. Thank you, Jim Gola. And thank YOU Google images. Another Mt Hood masterpiece from artist Cathleen Rehfeld. But I wonder what the view is like ... from the top! And this? I don't know who took this. But it made a beautiful marketing image for the Climb to Fight Breast Cancer. See? All good things can come from climbing Mt. Hood. But it's going to take some other good things to get me there. I need to raise $3400 to get to the top. 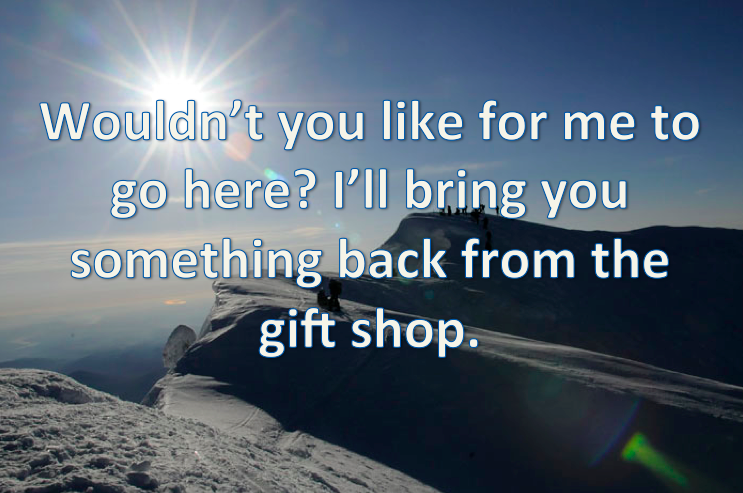 (please don't leave) I'm doing this because yes, I clearly want to climb a mountain. But also because I believe strongly that our lives would collectively be more healthy, vibrant and beautiful, if our air was cleaner, crisper and closer to its own design and further from ours. I can't clean the air on my own. Not like I have some magic sky vacuum. Yet. 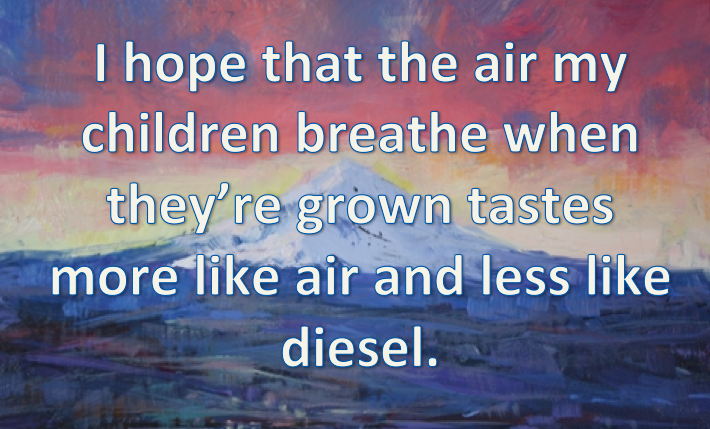 But I can raise money to help heal those whose health has been compromised by the air we breathe. Funds raised with my climb will benefit the American Lung Association of the Mountain Pacific. Their mission is about saving lives, lung by lung. By improving lung health and preventing lung disease. My mission is to climb, baby, climb and in so doing lend my sometimes quite loud and naggy voice in their support. I hope you can help me. Truly. I've now stood at your door, clipboard in hand, (for some time now), while your kids are running around in the background, the dog's trying to squeeze past you onto the front lawn, dinner's almost on the table, the baseball game is on and going in to extra innings, and you have a gazillion things you'd rather be doing than listen to me ask for money so I can climb a mountain. So please take this flier. Look it over. And if you can give, I thank you. From the bottom of my heart. If you cannot, I hope maybe you can in a few months when our debt crisis is solved and millions of middle class Americans are all of a sudden relieved from all financial burden and not left to shoulder our collective social debts. I get that. And if you cannot give at all, I understand that, too. I can't give to myself. So I don't doubt that you can't either. But I will ask one more thing (I KNOW! take take take!). If you cannot give, please give up smoking. Please. Completely. And if you cannot give and you do not smoke and have no intention of starting, please go on a hike. And breathe in the fresh air and give your lungs a good ol' fashioned tickle. Here's my flier. Which is, in fact, a link to my fundraising page. And yes, what I'm offering you in my flier/link, is totally on. Thanks guys. Mwah. Reason 1 why I'm uncool.